Barbaric’s uniLIFTER - the general purpose lifter for all production processes. 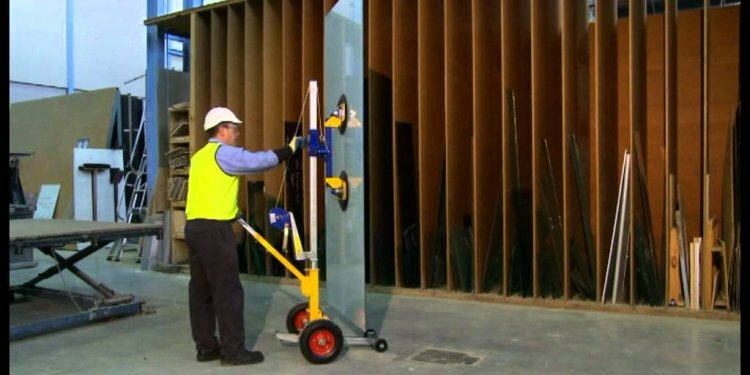 The uniLIFTER vacuum lifter is equipped with the ability to rotate and tilt for glass sheets up to jumbo sizes. Capabilities: rotate, tilt, and rotating/tilting. Designed with integrated chain hoist and associated safety equipment. For quick release of the glass sheet, Barbaric’s "push off equipment" safety feature is installed. Our special handling switch for "single hand" operation is mounted on a tiltable control arm. The ergonomic control arm includes all of the controls for the chain hoist and the vacuum lifter. Barbaric’s doorLIFTER has the ability to flip the glass. The doorLIFTER can come in a variety of sizes to accommodate many different size glass sheets up to 1200mm x 2800mm in size. The hoisting unit’s tilting drive is electrically driven, and is variable speed for ease of use. Barbaric’s suction cups feature a new type of rubber to minimize any possible marks from the suction cups. For quick release of the glass sheet, Barbaric’s "push off equipment" safety feature is installed. Our special handling switch for "single hand" operation is mounted on the operating arm. The ergonomic control arm includes all control elements for the chain hoist and the vacuum lifter. Barbaric’s Patented flexiLIFTER features a unique gripping system to handle work pieces on a frame. Different materials - e. g. windows, doors, glass plates, metal frames, claddings, stone slabs - can be manipulated without possibility of any damage! The clamping ability ranges from 50-150 mm, and the clamping pressure can be set and adjusted easily. The hoisting unit has a lifting speed that is infinitely variable for safe lifting. The flexiLifter is also suitable for packed goods. Barbaric’s B1 lifter is available in a wide range of sizes for the manipulation of many types of glass sheets. Barbaric’s suction cups feature a new type of rubber to minimize any possible marks from the suction cups. For quick release of the glass sheet, Barbaric’s "push off equipment" safety feature is installed. Our special handling switch for "single hand" operation is mounted on the operating arm. The ergonomic control arm includes all control elements for the chain hoist and the vacuum lifter. Barbaric’s B2 Glass handling system with rotating capability for ISO glass and windows. The B2’s hydraulic rotating drive enables exact positioning for ease of installation of ISO glass sheets. Special safety system prevents accidental release due to faulty operation. For quick release of the glass sheet, Barbaric’s "push off equipment" safety feature is installed. Barbaric’s B3 90 is available in a wide range of sizes for the manipulation of many types and sizes of glass sheets. Our special handling switch for "single hand" operation is mounted on a tiltable operating arm. The ergonomic control arm includes all control elements for the chain hoist and the vacuum lifter. Barbaric’s B4 is available in a wide range of sizes for the manipulation of many types and sizes of glass sheets. Barbaric’s suction cups feature a new type of rubber to minimize any possible marks from the suction cups. For quick release of the glass sheet, Barbaric’s "push off equipment" safety feature is installed. Construction for hook in a crane available on request. Use in your production or on the building site! Using Barbaric’s adjustable suspension point, almost vertical installation of a glass sheet is possible. Control of all movements carried out from the ergonomic control unit. Barbaric’s B4A is available in a wide range of sizes for the manipulation of many types and sizes of glass sheets. Movements are via a hydraulic system. Battery capacity minimum 10 hours. Barbaric’s B5 is available in a wide range of sizes for the manipulation of many types and sizes of BENT glass sheets. Barbaric’s B6 is used for lifting and rotating of glass. Thanks to the thin design, this is the ideal tool for moving glass safely out of storage racks in tight spaces. The 90° rotating drive enables manipulation of glass during installation to a window or door frame. Barbaric’s special safety system prevents accidental release due to faulty operation. For quick release of the glass sheet, Barbaric’s "push off equipment" safety feature is installed. 12 volt D.C., battery powered. Battery capacity for at least 300 suction cycles. Barbaric’s B9A is suitable for the pickup of glass sheets after sealing work. The B9A is ideally used for vertical transport of flat glass up to 6 x 3 meters. To avoid slipping of the glass plate the suction cups are on both sides and are arranged in pairs. 60 mm clearance behind the glass sheet is a requirement.